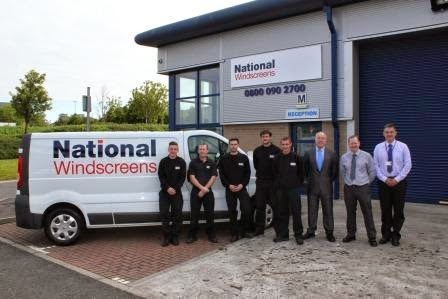 8th July 2014: National Windscreens Glasgow has received outstanding feedback from qualifications Awarding Organisation, GQA, for its ongoing commitment to the continued professional development of its employees after 19 technicians and three managers successfully completed SVQs (Scottish Vocational Qualifications) in the past 15 months. Regional Operations Director, Andy Rae, who supported all of the employees in the qualification process, comments, “I am extremely proud of all employees at the Glasgow fitting centre for their dedication in achieving their SVQ qualifications. GQA’s Head of Development and Delivery, Sean Hayes, was extremely impressed with the centre’s positive approach to professional qualifications. He confirms, “As the Awarding Organisation for the Automotive Glazing SVQs, it is always pleasing to see qualifications used to improve a business and recognise the skills and knowledge of the individuals; this is certainly the case with Andy and the team at National Windscreens. National Windscreens offers all of its glazing technicians the opportunity to complete Automotive Glazing qualifications from GQA and works closely with GQA assessors to ensure its technicians consistently work in accordance with the national standards. National Windscreens Glasgow is one of eight fitting centres located in Scotland - find out more by visiting the branch locator at www.nationalwindscreens.co.uk.